For the most demanding applications, PVDF lined pipe and fittings can be counted on to deliver superior performance and reliability. At SEMCOR, our more than 100-year history of helping our clients solve material and fluid handling challenges has led to our partnership with Resistoflex®, a leading manufacturer of PVDF-lined pipe. We are proud to offer the company’s complete lineup of products and to back up everything we sell with exceptional service and support. Based in St. Louis, we offer sales throughout the Midwest, and we can quickly fulfill orders of any size to Missouri, Illinois, Indiana, Kentucky and Iowa. Need a custom PVDF line pipe or fitting fabricated? We have extensive modification capabilities that allow us to meet the unique requirements of nearly any customer. PVDF — known commercially as Kynar® — is the toughest and most durable pipe lining manufactured by Resistoflex. It is extremely abrasion resistant and features a high thermal expansion coefficient. It is commonly used for demanding applications, including halogen and high-strength acid handling at temperatures up to 275°F (135°C). Because of the above characteristics, PVDF-lined pipes and fittings are commonly used in the pulp and paper, chemical processing and electronics industries. Common substances they are used with include chlorine gas, bromine gas, H2SO4 (up to 98%) and methyl chloride. For detailed specifications and more information about potential applications, contact a SEMCOR representative to request a product data sheet. SEMCOR sells and services PVDF-lined pipes and fittings by Resistoflex. 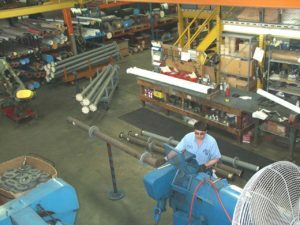 As one of the world’s leading manufacturers of piping solutions, Resistoflex has the extensive inventory of products necessary to meet the unique demands of our clients. We are a longstanding partner to this legendary brand, with an extensive inventory of products in stock and ready to ship. Our knowledgeable staff will be happy to help you go over your needs and select the right piping solution for your process. Any Resistoflex PVDF-lined fitting or piping can be customized to meet the unique requirements of any job. SEMCOR has extensive in-house fabrication capabilities, as well as a commitment to finding solutions to the technical problems that are affecting your operation. For more information about modifying a lined pipe or fitting, contact our office to speak with a representative directly. SEMCOR offers multiple options for anyone in need of PVDF or other plastic-lined piping hardware. Follow the links on this page for detailed information about individual products within the Resistoflex lineup of PVDF fittings and linings. You can also call or email our team for assistance with choosing the right product for your application.